The Tess Corners Fire Department team of volunteers is comprised of your neighbors, your friends and maybe even your relatives. They’re people just like you – with families, jobs and active lifestyles who still find time to give back to their community. The Tess Corners Fire Department offers a friendly environment for you to discover your capabilities and make the most of your volunteering investment. Organized on March 27, 1926, the Tess Corners Volunteer Fire Department has the distinction of being one of the oldest and fastest growing volunteer fire departments in the area. As a matter of fact, the history of the Tess Corners Volunteer Fire Department goes back even further than 1926. In years prior, the only fire protection for the area was from chemical carts purchased by the Vernon Mutual Fire Insurance Company. When a call was received, this cart was attached to an automobile and was pulled to the scene of a fire. In the year 1924, Mr. S.J. Salentine requested permission to bring one of these carts to the township of Tess Corners. With the interest in firefighting being high, a non-profit corporation was formed known as the Tess Corners Volunteer Fire Department, receiving its charter from the State of Wisconsin in 1926. ​The Tess Corners Volunteer Fire Department began answering calls in the township of Vernon, New Berlin, Franklin, Greenfield, Oak Creek and even Brookfield. In 1955, after a demonstration of rescue techniques by the Waterford Fire Department, the Tess Corners Volunteer Fire Department equipped all apparatus with first-aid kits and oxygen. 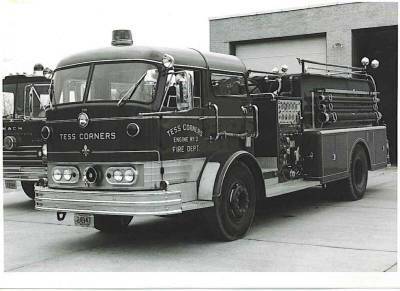 The Tess Corners Volunteer Fire Department then became involved in rendering first-aid, as well as fire protection services and received its first documented rescue call on March 11, 1960. 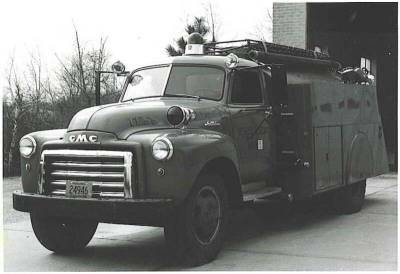 Given the expanded need for an emergency medical rescue service, the Tess Corners Volunteer Fire Department took delivery of its first ambulance and placed it into service in February of 1966. A second squad was added just three years later in 1969. 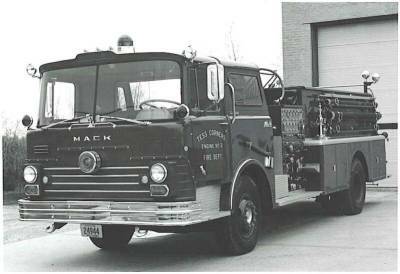 Given the rapid expansion of the City of Muskego and the increased volume of motor vehicle traffic, the Tess Corners Volunteer Fire Department placed hydraulic rescue tools, including the "Jaws of Life", into service in 1982. 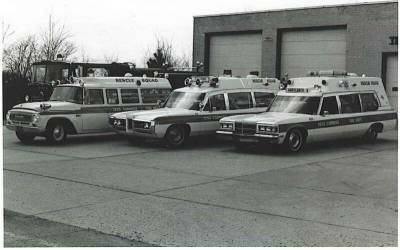 In 1984, a comprehensively equipped crash/rescue vehicle was placed into service to respond for any incident in which a technical rescue or extrication may be involved. 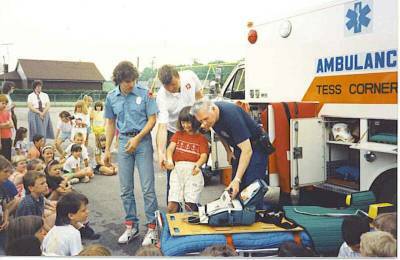 Other advances in the treatment of life threatening medical emergencies came in 1986 and 1988 when the Tess Corners Volunteer Fire Department was certified of administer epinephrine and defibrillation, respectively. By introducing these new skills, the Tess Corners Volunteer Fire Department was able to improve its level of care to the community considerably. In 1996, the Tess Corners Volunteer Fire Department also added the skills of non-visualized airways to its list of treatments for critically ill patients. The past 90 years have gone by rather quickly and both the Tess Corners Volunteer Fire Department and the City of Muskego have seen substantial growth. The Tess Corners Volunteer Fire Department has covered a lot of ground and is deeply rooted in history and tradition, yet we must always be looking forward to the future. It has been our pleasure to serve the City of Muskego and its citizens for all these years. We look forward with anticipation to the years to come.